MapGEN is a program written by Plutonic designed to generate random maps for particular schemes. It was first released on 11th July 2006. It now comes with a wormkit module so maps can be generated in game using settings saved in the main program. 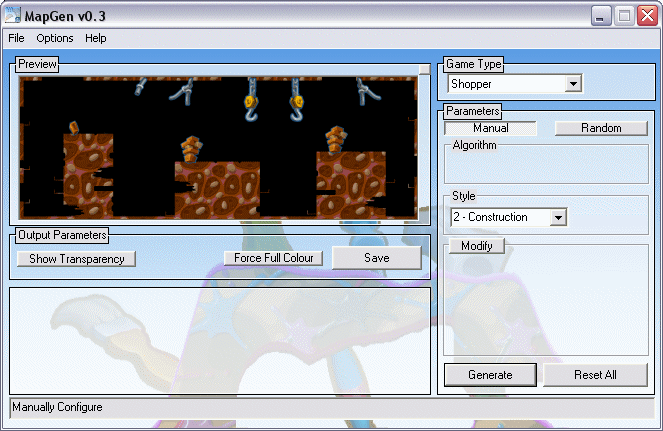 A folder called MapGEN will appear in the saved levels list containing PNG's for each scheme available. Due to the inherent size of packing up all the required images / themes etc. There are multiple options for downloading. Depending on what has changed in a given release, different options may be added or removed. Themes were changed in 0.6.2, if you have an older version you will need the full package. Random maps for BnG are in the form of an usland with vertical sides, the top of the island is covered with small bumps with terrain objects on top of them. Both sides of the map are kept similar, though not identical in order to give some balance without it being boring. There are two sliders available, complexity controls the "wavyness" of the top of the island, at its lowest the land will be completely flat (apart from the bumps), otherwise each bump will be offset vertically from each other my an amount based on the sliders position. Floaters are small round islands that are in the air above tha map, providing some cover. Canyon adds a small gap between the left and right sides of the map. Cavern adds a mini-cavern map under the ground, adding darkside tactivs to the game, or some risk when placing on thin land areas. It is also possible to re-seed only the objects using the modify button and clicking the "objects" option before re-generating.